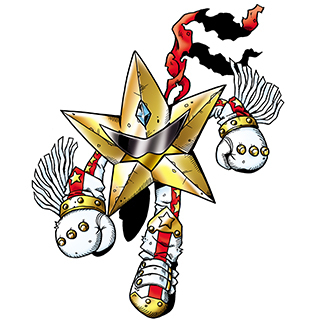 The Digimon Reference Book profile for January 15th, 2016, is Superstarmon. A translation is provided below; you may use it freely on forums, wikis, etc. so long as you link back to or cite this page. Profile: A Mutant-type Digimon that evolve to Perfect level from the warrior of space, Starmon. By polishing themselves to a level of self-satisfaction, they debuted as a star wearing flashy clothing. They disguises themselves with sunglasses in order to conceal their superstar status, but the sunglasses haven't been so useful in that regard. They call on countless meteorites to fall on their enemies from overhead with their Special Attack, "Halley Squall." The Digimon Reference Book is Bandai's official bible on the various Digimon species, first launched in 2007 and now comprising over seven hundred different Digimon out of the thousand-plus species that exist. It updates weekly with new Digimon profiles. Last week's profile was Hyougamon.